Snackeez Reviews: Is This Product Durable and Spill Free? $9.99 per cup (Retail price). $5.99 shipping and handling cost. Shipping of the product is done within thirty days. The buyer has thirty days to return the product in case he is not satisfied with it for a refund of his money. However, shipping costs are not refundable. The total cost then adds up to around $16.The buyer is given a second cup free. Snackeez is useful when you need a snack on the go. The upper compartment is filled with dry food while the lower with a drink. Snackeez has the ability to prevent spillage resulting from movement or even accidents. It can be used in the house while the children are playing interactive games or watching television. Snackeez has a non-slip rubber grip even when sweaty. Sip on the straw to drink and flip the plastic cover open to snack away. 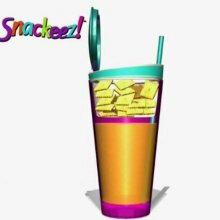 Snackeez is made of a colorful clear plastic cup with two compartments. The lower compartment is for your favorite cold liquid beverage while the upper is a removable compartment designed to hold snacks.It has a non-slip rubber grip. The snack and drink both fit in the container and can be held in one hand. The product is durable and BPA free. The product has seals to keep the snacks fresh and to prevent spills. Has a return policy where money back is guaranteed minus the shipping costs. Slow shipping. It takes time for the product to be delivered. Ordinary straws don’t fit in the straw hole properly. The snack compartment is small. The lids tend to degrade over time. The cup may be too large for very small kids to hold easily. Place it on a flat table and unscrew to removethe snack bowl. Fill the cup with your favorite drink up to the rubber grip level. Add your favorite snack to the container. Flip close the lid to seal everythinginside. Do not microwave any part of the product. The product is not intended for the use of hot items. It is advisable to wash all parts before using the product. Keep away from reach of children under 3 years. The small parts are choking hazards. The product should be kept in a child proof area. During the summer period most parents are always preparing snacks on the go for the kids because they love to go for outdoor activities. Instead of packing so many containers, Snackeez offers the real solution. The liquid and the snack can fit in one container which is easily accessible and cuts down on the mess likely to occur. It is easy to pack and carry around.You do not have toworry for leakages because the product has seals which prevent any spillage from occurring. The product comes in multiple colors so the customers have the opportunity to decide which colors they find most attractive to them. Snackeez is durable and can be used more than once. Enjoy your snack on the go with snackeez. Page Score: No Ratings Yet !